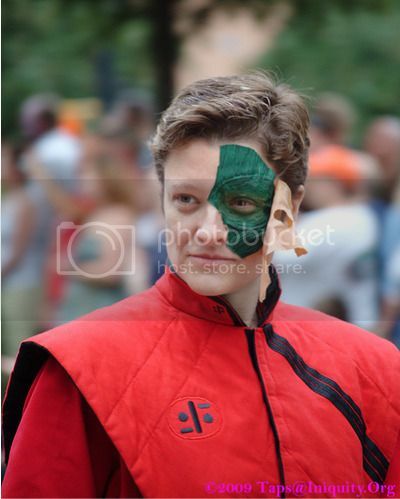 In honor of tonight’s premiere of the new and mediocre* “V” TV series, I offer you the Best Visitors Costume I Have Ever Seen, spotted this year at Dragon*Con. The usual, lazy man’s “V” costume includes a red suit and a pair of big, boxy sunglasses. Cheers to this lady for the extra work on the peeled-away skin revealing the lizardness beneath. I applaud attention to detail. Of course, I also applaud healthy skin care. But I am as forgiving as I am minty-fresh. * Feel free to tell me in the comments that I’m wrong. The door to your under-informed opinions is always open.